This task can archive (or delete) obsolete records from a database or filesystem. This attribute specifies a cluster node on which the task may process. This attribute is accessible only in Cluster environment. If it is empty, it may be any node; if there are nodes specified, the task will be processed on the first node which is online and ready. There are two possible values: delete or archive. Delete removes records without any possibility of recovery. Archive option removes records from the database, but creates a ZIP package with CSV files containing the deleted data. Time period (in minutes) - specifies which records are evaluated as obsolete. Records older than the specified interval are stored in archives/deleted. Output path for archives This attribute is useful only for the archive option. Include executions history If checked, Execution History will be archived/deleted as well. If checked, the archivator saves/removes all graph temporary files older than the value in Older than attribute. 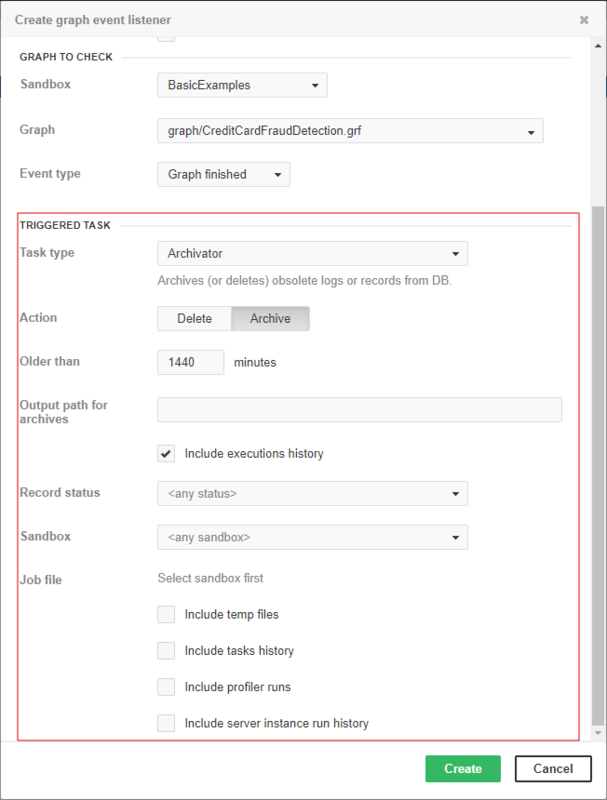 The temporary files are files with graph debug data, dictionary files and files created by graph components. Note that log files are not considered as temp files. If checked, the archivator will include run records. Log files of graph runs are included as well. Include profiler runs If checked, the archivator will include profiler job results. Include server instance history If checked, the archivator will include server instance history as well.